The shopping cart being filled by two guys in the Westport supermarket looked suspiciously familiar—-mostly steaks, chops, and frozen pizza. “Fishing trip?” I asked…Yep, indeed. But this wasn’t the Washington coast, it was Westport, South Island, New Zealand, where I was visiting friends. A modest fleet of small, sustainable-fishery boats works out of here and from Greymouth, just down the coast. The two carnivores were happy and excited to get going, just about to head out for the albacore grounds. The fish were about seven hours’ run offshore, they said, not too bad a steam. I wasn’t so rude as to ask what lures they were favoring, but a visual dock survey indicated green/yellow jig colors were the thing this season. I wished them good fishing, and went back to my exploring. Any mariner new to these waters should consider that channel marker colors here are the reverse of those in the U.S.! Just like everywhere in the world besides North and South America, Caribbean, Japan, Taiwan, and the Philippines, it’s green right returning—-a good thing to know to avoid embarrassment (or worse). 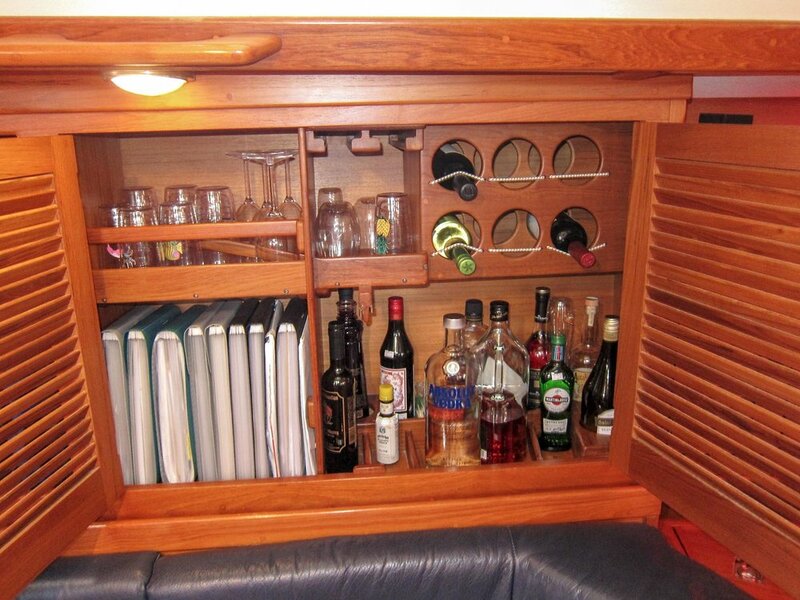 When’s it appropriate to use alcohol (or other stuff) onboard? Tied to the dock? Securely on the anchor? In easy cruising conditions? Whenever? To some extent this bothers me. But I’m a pragmatist, and I find a happy hour with a one beer a day limit even when offshore can make an enjoyable break in the daily routine and bring a crew together. If that limit is strictly observed, I feel the risk is minimal. Owners’ participation can make things trickier. Those who are okay with a one-beer policy, and those who don’t want any drinking at all, I’m fine with. If they turn out to be heavier drinkers, I don’t feel it’s my place to object. But I can accept that they’ll be unreliable in an emergency and plan ahead so their help is not needed. I’ve only experienced this a couple of times, and with no serious consequences. Much more serious disruption has resulted from owners, or crew, who try to quit an addiction—-to alcohol or something else—-by going cold turkey when the boat leaves the dock. I’ve learned to be careful in screening out anyone who might try to unmedicate themselves in that way. 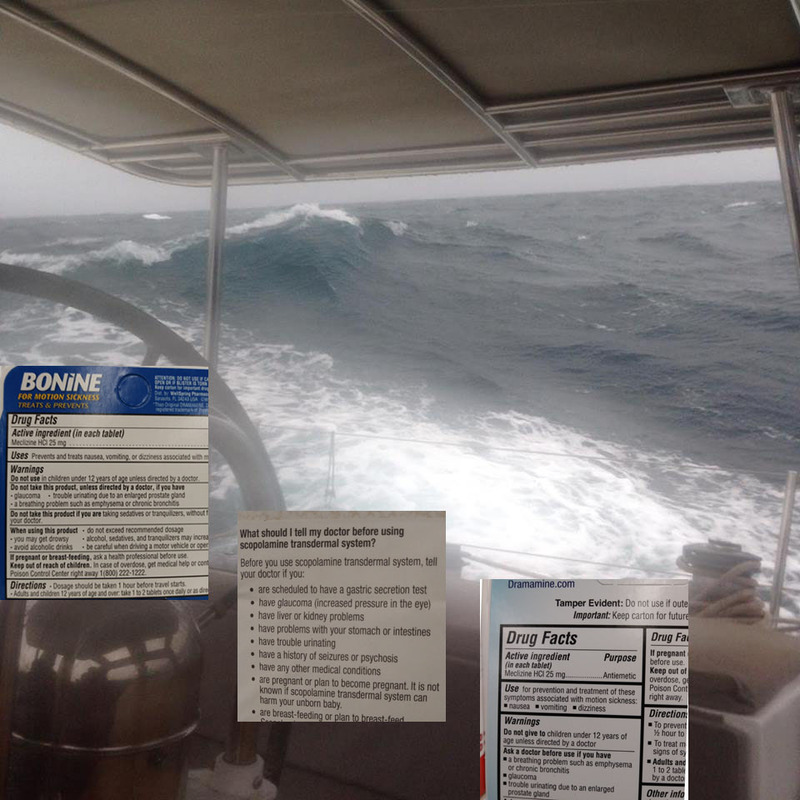 Offshore passages, especially long ones, come with their own inherent stress levels, and most experienced sailors and cruisers are realistic about avoiding any extra impairment that might imperil the voyage. But, as we see, the ideas on how to achieve this vary. What’s your pleasure? Part II---do bridges have personalities? Seemed so, as we navigated the Ship Canal from Lake Union to Puget Sound. The first of the three on that stretch is the Fremont Bridge; we gave a good loud long/short horn signal, came up close and waited. No answering signal. Waited, waited…waited and waited some more. After 15 minutes the bells went off, gates came down, and we got a lift. Why so long? Mid-day auto traffic wasn’t heavy. The Fremont bridge: either oblivious, or obtuse. Half a mile farther at the Ballard Bridge, we repeated the process, got close and gave the hoooooonk honk---and got a honked response, and an immediate opening. A laudable bridge! Enthusiastic, eager to please. Going down through the Locks, we could see the Burlington Northern railroad bridge was open. But as we exited the chamber, it had closed. Motored up, sounded the signal, waited. Even longer than at Fremont, but this made sense; the operator has to monitor when the next train will arrive. If one came when the bridge was open, and it ran off the rails into the Canal, it would be inconvenient. Eventually a train---a very long train---rumbled up, passed, disappeared. The bridge stayed down. As we continued waiting, we entertained ourselves by maneuvering against the current to keep from being swept down into the closed span. There’d been no sign of life in the tower since our arrival, and eventually I ignored policy and called on VHF 13. No radio answer, but we got a signal---five shorts on the electronic horn, meaning: look out! Not too long later, another train passed and we got our lift. Personality of the Burlington Northern Bridge: cautious, businesslike. But also, as I discovered later after a close reading of the regs, a little obtuse. Once an operator hears a boat signal, they are supposed to give a response. Neither Fremont or BN did. But Fremont gets a little slack---an operator has the option, it turns out, to wait until traffic eases before opening. However, ten minutes is the limit for such waits, clearly exceeded in this case. Clearly, though, one is grateful for any kind of opening. Thanks to all three! But the Ballard Bridge rocks. (1) You need a bridge opening to make your passage. What's the best way to get a lift? (2) Which is the Puget Sound bridge pictured above? (1): All are legitimate signals. 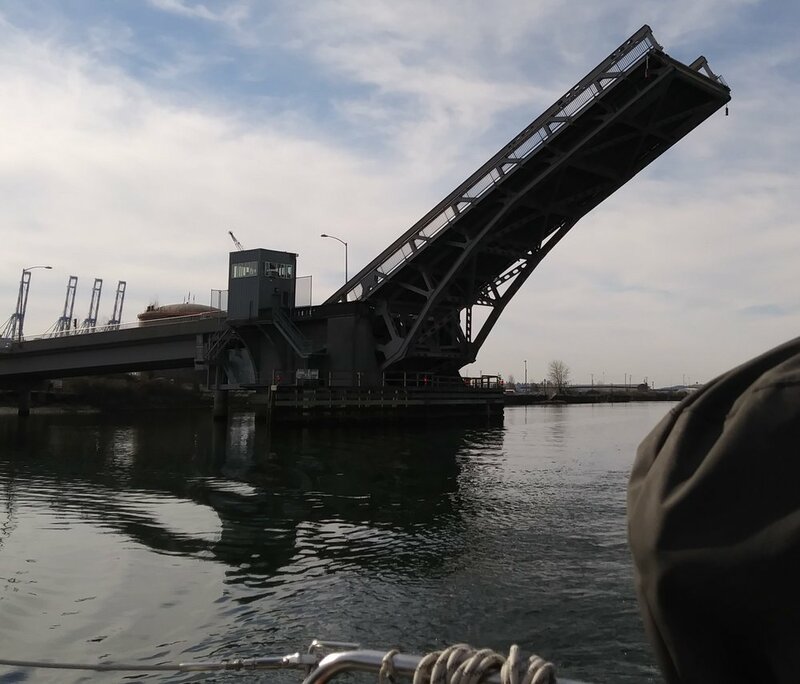 However: some bridges use sound signals that differ from the mostly-used long/short; in Seattle, at least, rec boaters are discouraged from using channel 13; the white flag is a legitimate request signal…but rarely used and a less vigilant operator might miss it. The takeaway---plan your voyage well beforehand and add bridge and lock characteristics to your study of local weather and currents, shipping lanes, available harbors, etc. What do you do when your electronic voltage regulator stops regulating in the middle of a delivery, and your batteries are trying to flatline? Several options: 1, replace it with the spare that’s on board; 2, go into port and buy a new one; 3, use your generator to keep the batteries charged. Let’s say, as was the reality on this long delivery of an 80’ sailboat from Florida to northern Mexico, that you had no spare regulator. And let’s say that you were a long way from any port, and so elected to use the generator, which you did have. Let’s also say that your generator was not the smartest piece of equipment, able only to charge full bore whenever it was on. In effect you became the regulator, turning the unit on and off to keep the charge in a safe range. Let’s say that you became tired of this, and put into Manzanillo, Mexico to find a replacement. Manzanillo, which is not exactly the yachting capital of the world, had no electronic regulators in stock. What it did have, you found by calling around, was an auto parts store that stocked heavy duty school bus regulators, so you taxied there, and bought one for $25. Was it disconcerting that this old clunky unit looked like it came out of a 1950’s vintage school bus? Yes, but only until you had it wired in, fired up, and found it worked perfectly. 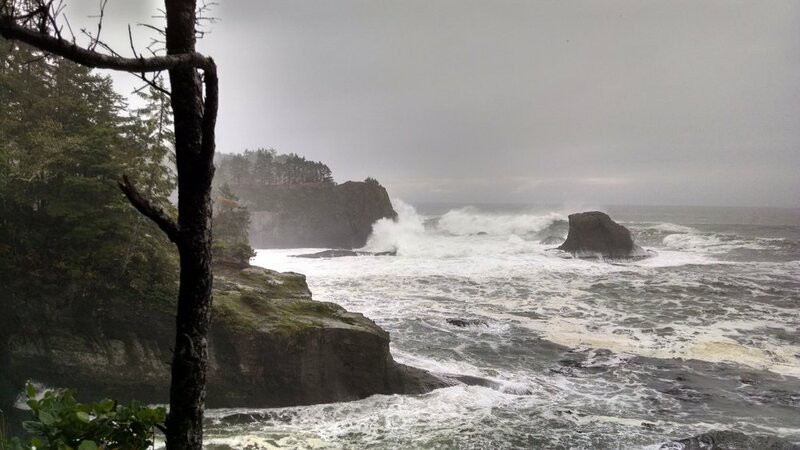 This day was in the "mostly not" category: Twenty-foot seas crashing into the high cliffs at Cape Flattery. A good day not to be going anywhere offshore. But see the recent Facebook post for dramatic update.